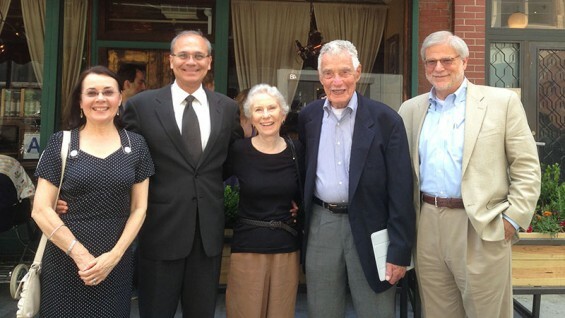 Ed Durbin (EE'48) Funds Student "Invention Factory"
Edward Durbin (EE'48), one of The Cooper Union's most generous benefactors, has made a gift to support a new, annual fund dedicated to engineering innovation. 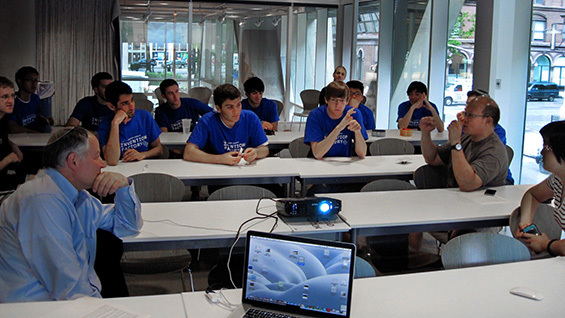 The Edward Durbin and Joan Morris Innovation Fund for the Albert Nerken School of Engineering provides discretionary funding to promote research, improve pedagogy in STEM (science, technology, engineering and mathematics) disciplines and sponsor entrepreneurship. In short, the fund enables the Dean of the School of Engineering to advance exciting curricular initiatives at his or her discretion. This year Acting Dean Alan Wolf has used the funds to create an "Invention Factory" for current students to focus on developing patentable, working prototypes of their own ideas. "The desire to stimulate students to be creative and improve their chances for enhancing their careers was the inspiration for the Invention Factory program," Ed Durbin says. "I am happy to able to do this with the encouragement of the administration." Dean Wolf, who is a patent lawyer and has taught patent law at Cooper and elsewhere, saw a need for teaching students the basics in exploiting their own inventions and an opportunity for the Cooper Union to share in any royalties that result from inventions created at the school. "The big thing for the kids is: this will teach them how to invent and how to protect their intellectual property," Dean Wolf says. Run under the supervision of Dean Wolf and Professor Eric Lima of the mechanical engineering department, the Invention Factory is a six-week summer program that provides participating matriculated School of Engineering students with a $2000 materials budget, a $1000 stipend and free lunches during their required six-hour daily attendance. 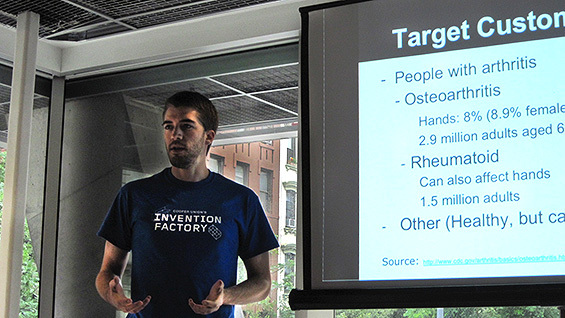 The twenty accepted applicants work in ten teams of two on an idea of their choosing (subject to approval) researching previous related patents, known as "prior art," as well as creating a working prototype of their invention. Twice weekly reviews by outside evaluators will hone the inventions to being as unique and useful as possible. At the end of the program judges will select one invention as the most promising and award the inventors a prize of $5000. The Cooper Union has the right to patent any invention developed, potentially creating a long-term revenue stream. "Schools are terrible at commercially exploiting their inventions through their students," Dean Wolf says. "What happens is the student comes up with an idea, then they go to a faculty member and spend six months to two years developing it. Finally they say 'Oh yeah there might be a patent in this.' So they check and discover that there is prior art. Intellectual property is always an afterthought. Prior art has to be checked first so you don’t waste your time inventing what is already out there. Every senior working on a yearlong design project should be doing this before they start. That way there is a chance they can do something marketable." Participants met with Mr. Durbin and his wife Joan just prior to the start of the program, impressing the Durbins with their invention ideas. After the first week Dean Wolf also likes what he sees so far. Alyssa Davis and Alara Dirik are developing a better coat check method -- "You can patent a method as much as a device," Dean Wolf says -- based on Davis' experience as a restaurant coat checker. Other ideas include a better jar opener to assist the disabled and an umbrella stand that dries the umbrellas using a system similar to the Dyson Airblade hand dryer. The final judging will take place on July 10. Ed Durbin, a former Vice Chairman and Director of Kaiser Aerospace, has pledged to support the Innovation Fund through his estate plan so that it will last in perpetuity. It is the fourth such fund he has so endowed or pledged to support, including The Sylvia Appleman Painting Award in his late wife’s name, the Durbin Faculty Development Grant and the Durbin Scholarship Fund. "The education I was given by the school was the cornerstone of my whole career for which I am everlastingly grateful and I have always tried within my means to say thanks for the head start," he says.